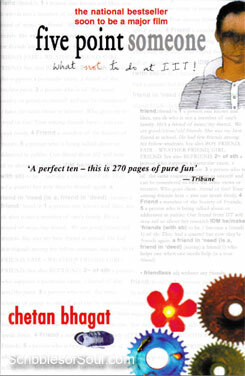 I have, just finished reading ‘Five Point Someone’ by Chetan Bhagat. And, though it did not convert me overnight into a die-hard Chetan Bhagat fan, as the tag of national bestseller seems to indicate, I must say that the novel is way better than the forgettable ‘Three Mistakes’. The story was captivating enough to forgo three hours of my sleep (I slept at 01:30 am last night, after the excruciating read of four hours, and its not everyday that I let a writer disturb my beauty sleep!) and I enjoyed the novel, while it lasted. Though, initially, I was a bit biased towards the novel, as I kept comparing it to Amir Khan’s blockbuster movie ‘Three Idiots’. And, though, the incidents seemed familiar – ragging by seniors, falling in love with Professor’s daughter etc. I somehow, felt that chutzpah is missing and the story is falling flat in stark contrast to the movie. However, the feeling lasted for only a few pages, as to author’s credit, he was able to connect with the reader in me and soon, I was enjoying the book, as I would any other fresh story. Talking about the story, it revolves around three boys, dashing Ryan Oberoi, geeky Alok Gupta and nervous Hari Kumar. The story begins with the entry of these three boys in one of the most prestigious institutes of India, IIT Delhi. However, the very first night turns out to be a nightmare, as they are subjected to humiliating ragging by some pervert seniors. But, the incident brings out the good human in Ryan and he slaps the seniors to protect Alok and Hari from being subjected to gross abuse. The first night incident ensures that the three boys become chaddi-buddies for the rest of their life. The three boys were brilliant students in their schools and worked hard to gain entry into IIT, but indifferent attitude of Professors, severe load of assignments and mindless cramming, with plain emphasis to get good grades or retire home, plays havoc with their nerves, and before they could even understand, they are labeled as under-performers, “the five pointers”, who have no place amongst the intelligent nine pointers, and are destined to sit on backbenches and be evaporated into oblivion. The fun loving attitude of these three friends further, slide them downwards and they are ready to crash onto the hard lands outside IIT. How do these boys survive the onslaught of nutty professors, dissuade the charm of vodka, grass and girls and whether they would indeed be able to grab a job-the sole criteria of a successful IITian, is wonderfully narrated in this debut novel of Chetan Bhagat. The novel is written in first person, with the viva-shy Hari Kumar taking the center stage as the narrator, giving the reader an insight into Ryan, Alok and his own personal life. More than anything, the author’s direct and concise approach towards college life impressed me. The novel is written in the cool lingo of collegians, with a liberal sprinkling of slang and curses, however, it is to author’s credit that nothing in this novel affect you as vulgar or abusive. Everything falls in place, considering we are reading a novel, showcasing the most carefree phase of three boys, on their route to become competent men. And, the book convincingly conveys a dream, everyone nurtures, but only a few could actually live out while on college campus. I particularly liked the novel from the middle onwards, and, I just did not want Hari’s longest day to end. The book is set in Delhi and does take into account the happening places of the city and even talks about the entry of CNN via the much famed Iraq War. The inclusion of these real-life events and hanging joints gives an authentic appeal to the novel, and makes the reader more connected. Add to it, the simple conversational language, and you have a definite winner at your hands. However, it is not as if the book is all hunky-dory and free from any defects. In fact,I found quite a few potholes, that made the journey tedious and uncomfortable. First of all, I was disappointed with the Prologue of the novel, especially since it was the only part I liked in ‘Three Mistakes’ and I expected Chetan to be a little more discreet than repeating a few lines of his book’s most engrossing chapter. Though, it did stir reader’s interest, when a tragedy is described in the very beginning, however, in a peppy novel, it gave an ominous start, and, it would have been much better if the author tried to say something original in the prologue, rather than lifting a few paras, presenting a half-baked beginning. The second issue is regarding the shabby treatment of wonderful literary tools of letters and monologues. Bhagat used first person narration of Hari, to tell the story of three friends, but, for some unexplainable reasons, he added two chapters, voicing Alok’s and Ryan’s views. I have seen Chitra doing wonders with letters/mails/essays in her novel ‘Vine of Desire’ to give a mental picture of the protagonists, and highly regard the importance of monologues courtesy Shakespeare. But, in Chetan’s in-deft hands, they remained just a blot on paper, reducing the speed of the narrative like an undesired speed breaker and mitigated the mesmerizing appeal of the story. And, last but not the least, I was seriously disappointed with the end of the novel. The build-up to climax was good. I would have really loved the book, if it was ended with the emotional speech of Professor Cherian. Though, this end would have been dramatic, but, I think, in a novel, where students go drunk in viva, and think nothing before climbing the roof of the college, to have a quickie with grass and girls, it would not have been too much out of place. However, to give a real life appeal to the novel, Chetan stretched the story way beyond the logical end and spoilt a potential climax. However, despite a few flaws, I did like the book as a whole. After all, getting 270 pages worth of pure fun for just 60 bucks is not a bad deal! And, I can say with utmost conviction that Chetan is the most economically viable and pocket-friendly authors of our time! Jokes apart, I am happy with the debut novel of Chetan Bhagat and enjoyed the biography of an average student in an over-rated college, laden with stress, peer-pressure, unbridled freedom, tantalizing one to commit mistakes in life and learn from them. Definitely, a good beginning by Chetan!